BICYCLES LEFT IN ANY OLD PLACE Someone at the Press Democrat - probably editor Ernest Finley - viewed himself as the Bicycle Cop, prowling the mean streets of Santa Rosa at night in search of "wheels" left out overnight. When, o when will these trusting fools ever learn?!? Also: an item about the near-death experience of Miss Luetta McCombs, whose bicycle was destroyed as she tried to cross the railroad tracks ahead of a train. "It is believed that the railroad company will present Miss McCombs with a new bicycle," reported the PD. THE ARCHITECT'S BRIDGE It was reported before the earthquake that noted architect William Willcox had designed a new bridge for E street, but there was no further mention in the following year. This City Council item shows that the city did use his plans, after all. NEW HOUSE REPAINTED A small item that the Lumsden house - now the Belvedere bar and restaurant - was being repainted. Why would they go to the trouble and expense for a fine house less than five years old? COLORED VIEWS OF SANTA ROSA Postcard collectors, rejoice! Here's a date for the series of post-quake photographs of Santa Rosa published by Rieder, one of the largest publishers in the country. The most famous early photo of Comstock House is probably from this photo shoot, but we'll wait until we can verify that this card was indeed from his publishing house. THE FORTUNE TELLER'S LICENSE Both newspapers regularly had classified ads for spiritualists, palm readers, and fortune tellers, and apparently Santa Rosa didn't care - as long as they had a business license to peddle their hokum. Here Mrs. M. A. Young asked the City Council to wave the fee so that she could practice "her art of astrology," although the "revenue from her business would not justify her to pay the license imposed." "Some are taking to it kindly, and are preparing for vaccination; others are not and are raising many objections. I am afraid that there will be considerable trouble in some circumstances," said County Superintendent Montgomery yesterday when asked concerning the enforcing of the vaccination law in the public schools of Sonoma county. The other morning, about 1 o'clock, when practically nobody was about, a Press Democrat representative counted within two blocks on Fourth street sixteen bicycles. Some of the wheels were standing up against buildings, others against the curbs or posts while several were left sprawling half across the sidewalk. And this is what one sees night after night. Repainting Fine House--W. H. Lumsden is having his home at the corner of Mendocino avenue and Carrillo street repainted. The work makes a neat improvement in the appearance of the place. Removed Ornamental Trees--Louis Kearney, assisted by W. H. Schieffer, removed a number of the ornamental trees from the courthouse yard yesterday, and they wee taken to the County Farm where they will be set out in the hospital grounds. Impossible to imagine today, but someone was hired to "compute the stumpage" of logging Armstrong Grove in 1907 in preparation of its upcoming sale to loggers. For more background, search the Press Democrat archives for the January 20, 2008 article by Gaye LeBaron (sorry, no permanent link available). One of the only two groves of redwood trees in Sonoma county remaining unmarred by the woodman's axe is now threatened with the fate of destruction. It is the Armstrong grove of twenty acres near Guerneville, not far from the famous Bohemian grove, famed throughout the world. It is now owned by Walter Armstrong and Mrs. Lizzie Jones, children of J. B. Armstrong. It is said that men representing the "lumber interests" have been dealing with the present owners of this magnificent woodland, and that an agreement has been reached regarding the price that will be paid for the monarchs of the forest. F. W. Hoffman is now in the grove computing the stumpage. The grove was reserved by the late Colonel J. B. Armstrong when he sold or cut the timber on the rest of his land, who declared that Armstrong grove should remain the heritage of seceding generations. The trees there are among the best in the state. Some of them were big trees when the pyramids of Egypt were built. They are the few remaining monuments of antiquity of California. Since the despoiler's axe has cleared away nearly all their noble fellows, these giant redwoods have been one of the great sights of Sonoma county. Their destruction will be deeply regretted by all who know them. To cut these towering trees into material to build bridges and barns seems an equal sacrilege to the tearing down of the Washington monument and using its stones to pave an alley. Even worse, for a new Washington monument could be built within a year or two; but a new grove of redwoods cannot be grown in less than four thousand years. The beautiful grove of redwood timber near Guerneville, known as Armstrong's grove, is likely to be sold in the near future. It is probable that when the transfer has been made the many handsome trees in the grove will be cut down and made into timber. Men representing lumber interests have been negotiating for the purchase of the timber for some time...Professor Freedom W. Hoffman, in charge of the Sebastopol schools, has been engaged the past week in estimating the quantity of timber in the grove, and when this task has been completed, it is understood the sale of the grove will be consummated. Pretend that you live in a town - say, 1906 Santa Rosa - that suffered a major disaster - say, an earthquake that killed scores of people and left the downtown in rubble. A few weeks pass and you're worn down by mourning and stress and just plain bored. So what could you do for fun? The town went roller skate crazy when a very nice skating rink opened that summer, and seemingly everyone in town turned out to whirl around the rink or to watch experts perform (there was a gallery that could seat a thousand, and professionals appeared regularly). But there's not much variety to the sport, and Santa Rosans were accustomed to being entertained. Before the quake, there were two theaters: The cavernous Athenaeum, where plays and stage shows were performed, and the Novelty Theatre, which presented Gong-Show quality vaudeville acts. Both were destroyed in the disaster. The first post-quake playhouse was The Hub Theatre, which apparently opened its doors in September with an address of simply, "Main st." It's difficult to determine where it was, because the two blocks of Main between Courthouse Square and Sonoma avenue were almost completely flattened; it was probably in a long, narrow building that had been used to store buggies, and is now part of the site of the Roxy Stadium 14 movie theater (quite a nice coincidence, that). At first, The Hub offered more cheesy vaudeville acts such as "Marco the Boy Magician," and "Flood and Hayes, Renowned Trick Jumpers." But it wasn't long before the shtick variety programs were replaced by plays performed by the Columbia Stock Company, Al Richter, manager. They offered a new play every week, with three evening shows and a matinee. By early 1907, the ensemble had become the Al Richter Stock Company, with performances seven evenings a week plus a Sunday matinee, which was probably more of a dress rehearsal. It's no small feat to assemble an acting troupe, and Mr. Richter must have been an interesting character with boundless energy. But Orson Welles he was not, and the plays he presented were hardly cutting edge Ibsen. The newest play I can find advertised was about 8 years old at the time, and the oldest predated the Civil War. These were farces and potboilers, with titles such as, "The Moonshiners", "Wanted, A Baby! ", "Too Much Mother-In-Law", and "Nugget Nell, or the Pet of Poker Flat." These early-to-mid Victorian era plays often leaned heavily on ugly racial cliches; villains or comic characters might include a "drunken Indian," a "giddy Celestial," a "lazy Colored servant," which meant that the Richter Stock Company made heavy use of burnt cork, yellow and red paint along with demeaning and crude dialect. One week Mr. Orrin Shear was playing "Johnson, Colored Gentlemen" in their production of "Little Alabama," and a few weeks later portraying "Ratts, the slave auctioneer" in "The Octoroon." Entertainment options bloomed in 1907, with vaudeville acts at the new Empire Theatre on Third street, a few doors down from the ruined courthouse. There was also the Star Nickelodeon at 414 Fourth street showing continuous motion pictures. And just before Thanksgiving, Al Richter opened his new Richter Theatre on the northwest southwest corner of B and Third street (currently a pitiful grassy knoll outside the mall, across from Wells Fargo). On the first anniversary of the Richter Stock Company that autumn, Press Democrat editor Earnest Finley wrote an approving commentary: "Nearly all of [the productions] were good, and some indeed excellent. The players as well as the plays have been of superior character, and the prices have been much less than were formerly paid for entertainment not so good." But all was not sunny that year for Al Richter. Theodore (T. T.) Overton, brother and business partner of Santa Rosa's mayor and one of the town's movers and shakers, announced that he was going to build an even bigger theater and organize his own company of actors. The Press Democrat featured a drawing of "Santa Rosa's New Theatre" (not reproduced here because of poor microfilm quality, but it can be found in the Feb. 26, 1907 edition) that would seat 700 and have a state-of-the-art design by architect Victor Dunkerley, who had just designed the jewel of the new Santa Rosa downtown, the Overton Hotel. The cathedral-like playhouse would have 10 exits that could be opened "with the throwing of a single lever in the box office, which would be a safeguard in case of fire or other cause which might induce a panic," according to the announcement in The Republican. Surely the spectacle of ten doors flipping open at once would have been a powerful temptation for scalliwags to cry "fire" in a crowded theater. That would have been intimidating competition for Richter, whose operation was showing signs it might be having money troubles. Attendance was apparently off; while still in the smaller Hub Theatre, the stage manager came out and urged the audience to patronize their homegrown productions because it was, after all, a local business, and everyone in town was doing their darndest to shop locally. Another hint at desperation was that Al Richter rented space for building and painting new sets "to give the people a new set of scenery each week as the bill changes at the theater." Read between the lines and it appears that he was making copies of stage sets from a theatrical service in San Francisco in order to save rental costs. It seems that this era of local theater ended in the spring of 1908, when it was announced that the Richter Theatre was henceforth a vaudeville house. "From the large and appreciative audience it would seem that the change was to the liking of the patrons," The Press Democrat snarked on May 15. In the following months it would also serve as a movie house/nickelodeon and a week-long rental theater for traveling acting companies. Ads announced in September that there was a new manager at the theater, and it followed soon that it had been sold. The new owner was Mr. Overton, who somehow had never gotten around to building his expensive and extravagant playhouse, although Santa Rosa was promised more than a year before that "the building [was] practically assured." He hadn't gotten around to founding his own acting company, either; maybe he was disappointed that he couldn't get the Richter Stock Company as part of the deal. Although Santa Rosa no longer has the good theater building that it had before the fire, the people who go to plays have been better entertained within the last year than ever before in the city's history. Occasionally there was a good play at the Athenaeum; but, depending entirely upon road companies, that playhouse often billed shows that sounded the depths of inferiority. Since the Richter Stock Company has held the Hub theatre, to which little playhouse local theatre-goers have been compelled to journey by reason of the lack of a bigger and better one, fifty-two different productions have been presented, nearly all of which were good, and some indeed excellent. The players as well as the plays have been of superior character, and the prices have been much less than were formerly paid for entertainment not so good. There have been no grand stage settings, no large orchestras, no spectacular extravaganzas. The entertainment has been chiefly light melodrama, considerably below the highest form of dramatic art, but far above the childish humor of the comedies so popular in even the "dramatic centers," and even further still removed from the vulgar indecencies of suggestive pruriency idocy [sic] of the "slap-stick" variety. It is pleasing to know that before many months Santa Rosa will have a theatre better adapted to its purpose than is the Hub, and that the Hub's company will tread the boards there with much better accessories for creditable productions. The old company in its new home should be one of the town's "institutions." Ten exits have been provided for the structure and all can be opened with the throwing of a single lever in the box office, which would be a safeguard in case of fire or other cause which might induce a panic. In construction and appurtenances the new structure will be up-to-date in every respect and fire escapes will be provided for the outside of the structure. The perspective is quite a handsome one, and on one side of the building will be the work "Music," and on the other "Drama." "The Octoroon," which constitutes the attraction at the Hub Theatre this week is a strong play, and in the hands of the Al Richter Stock Company furnishes a fine evening's entertainment. Not many patrons of the house will be apt to miss this week's bill. RUSHING WORK ON "THE RICHTER"
It is Mr. Richter's plan to give the people a new set of scenery each week as the bill changes at the theater, and to do this he will have considerable of a task as well as heavy expense. In order to hasten matters for the present he sent to the metropolis, where he secured a number of exterior sets and these are already on hand. Mr. Richter is an enterprising man and is determined to make the productions at the Richter equal to the best there are. The poor Santa Rosa Rural Cemetery has been abused more than the proverbial borrowed mule. While it's probably now in its best shape ever - thanks to Bill Montgomery and a crew of volunteers (which you are WELCOME TO JOIN, on the third Saturday of every month at 9AM) - the sprawling old dear has weathered dark ages of neglect. It appears that about every 25 years there was an awakening that the grand hill had shamefully turned into a hobo jungle and delinquent playground, and efforts were made to clean it up. But after awhile the do-gooders lost interest, or moved away, or became old. Not so the vandals, not so the weeds. In one horribly misguided effort to bring the undergrowth under control, the city set fire to the place, destroying many wooden tombstones. 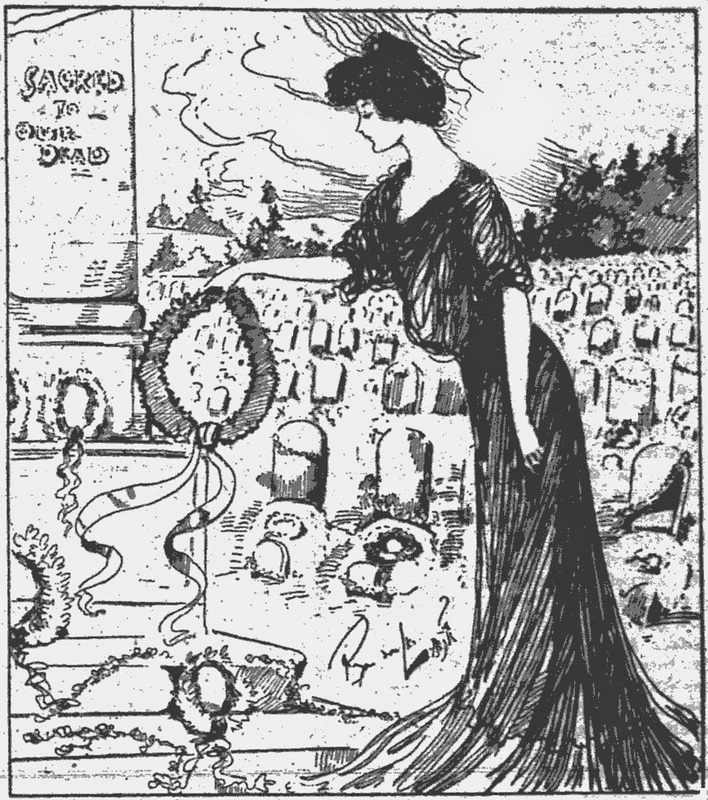 The first effort to reclaim "the silent city of the dead" came in 1907 from the Woman's Improvement Club, which did many good deeds around Santa Rosa. On the designated day, volunteers "gathered up the old cans and jars and bottles" in the cemetery, and wagon loads of weeds were removed. The club vowed to hire a sexton to watch over the grounds, and to generally fix up the place. Also included below: A detailed description of the new undertaking parlor operated by Mr. Moke and Mr. Stanley, which was at 421 Third street, (approximately between the Apple store and Sears in today's downtown mall). Your obl. Believe-it-or-Not footnote: Herbert Moke's wife and one of his children were killed in the 1906 earthquake, and although Moke and Stanley owned swathes of burial plots on the perimeters of the Rural Cemetery, the gravesite for the Moke family is in the Odd Fellows' cemetery behind the two old temporary holding vaults. The women of Santa Rosa, represented in the large membership of the Improvement Club, believe that the quiet city of the dead--Rural Cemetery--should be kept more reverently. They want to see the weeds removed from the pathways, the tall grass and briars taken from unkempt lots and a general clean up. They want attention paid to all the graves, whether those who rest therein have relatives or friends living here or not. There are many graves in the cemetery that are not kept green for the reason that there is no on left or kith or kin to even give the last resting place the passing tribute of a sigh, except such a sigh as might emanate from one moved by the wilderness effect of some of the plots. So while not blaming anyone for the condition of affairs at the cemetery the women voted on Monday afternoon to ask the directors to allow a general cleaning up to take place in the cemetery on Saturday, November 23. The secretary of the board of directors was seen and he said he did not think the board would have any objection to the plans outlined by the ladies. Consequently the day and date named have been designated "Cemetery Cleaning up Day" in Santa Rosa. The club asks all owners of lots in the cemetery to clean them on this day. They ask all citizens who will assist to do so. They also ask the boys of the Santa Rosa High School to help in the effort. The women want all who can do so to bring rakes and hoes. While they expect to superintend the work of cleaning up the cemetery on this day they will also work if necessary so anxious are they that the cemetery be made more neat. H. H. Moke, the undertaker, is moving his establishment from the temporary quarters he has occupied for nearly two years into the handsome rooms constructed especially for his business. The new parlors are the handsomest north of San Francisco and reflect great credit on the taste of Mr. Moke and Mr. Stanley. The rooms of the establishment are done in bird's eye maple and are beautiful in the extreme. The reception room is a large apartment and following this is Mr. Moke's private office. Then follows a mortuary chapel, capable of seating one hundred and fifty people or more. The chapel is fitted with permanent pulpit and with alcove ceiling, with room sufficient for the singers at the services. To the rear of this pulpit and entering at the left is something entirely new in this vicinity, a mourner's room. This department is designed that the mourners and relatives, if they close, may seek seclusion during the conduct of the religious services for the dead, or where persons may be taken in they are overcome from any cause and ministered to. This mourner's room has stained windows and is a closed apartment except from the entrance door. The workshop of the establishment is at the rear of the lower floor and the show rooms, where many elegant caskets are kept, is up stairs. This is a large apartment. The front rooms of the apartment are for the use of J. P. Stanley and they have been handsomely furnished for his occupancy. A large staircase reaches from the front hall to the second floor and there is also a rear stairs. An elevator has been installed for taking the caskets from the show room to the work room and vice versa. Saturday the ladies of the Woman's Improvement Club and hosts of others gathered at the invitation of that organization and spent the day cleaning up the center. It was a lively company that spent the house together clearing away the weeds and debris that had gathered in the City of the Dead, and with a right good will did they work with hoe, rake and spade. The attendance during the forenoon was good, but shortly after the lunch hour he people began to come and soon there was a great army of people industriously laboring to beautify the walks, drives and lots on the silent hill. The J. P. Fitts Lumber company sent out two teams and drivers, and Lee Bros. furnished a team and man, and there were other smaller wagons on hand, and these were all kept busy hauling away the grass dug from the walks. It would have done your heart good to see the way those women gathered up the old cans and jars and bottles that had accumulated and had them loaded into the wagons. Many of the graves were also decorated with an abundance of pretty flowers and the occasion took on very much the form of a memorial day in many parts of the burying ground. It was a great work and was well done and much credit is due the efforts of the zealous women who started the move and left nothing undone to make it a success. 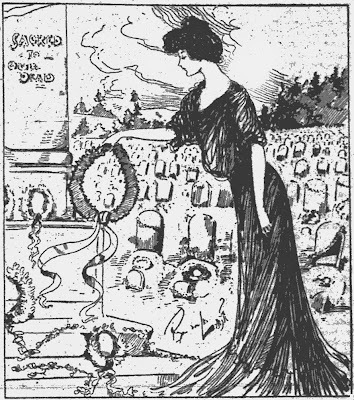 The fact that members of the Woman's Improvement Club should have considered it necessary to set aside a day for the cleaning up of the local cemetery emphasizes the fact that some intelligent and concerted method should be adapted for improving conditions in the silent city of the dead. The management of the cemetery is in the hands of a board of trustees who, while more than willing to keep the place up as it should be kept, are powerless to act for lack of funds. Either an assessment should be made upon the various lot-owners, or some means should be found to make possible the levying of a small tax, such as is now levied for the support of the public library, and a cemetery fund established. The latter result could be accomplished by taking the cemetery into the city limits, and a mere resolution of the board of trustees would put the first-named plan into effect. However, there would probably be no means of enforcing collection on an arbitrary assessment in case a lot-owner elected not to pay it, while a direct tax could be depended upon to bring results. There is no reason why Santa Rosa should not keep up its cemetery properly, and no reason why the cost of so doing should not be borne by the community as a whole. Wednesday afternoon the committee of ladies from the Woman's Improvement Club met representative members of the Cemetery Association and discussed plans for future improvement in the Cemetery. Among the first things to be undertaken will be the graveling of the roadways and the replacing of broken culverts. Garbage cans are to be purchased and placed in the several different localities wherein people are requested to throw all rubbish and faded flowers. Later, in the Spring in all probability, the question of doing some landscape gardening around the entrance will be undertaken. If you asked Nancy Lou Farmer about her neighbors, you'd better have some time to spare. She'd bend your ear with details of how her neighbors were obnoxious, stayed up late, had noisy visitors, and generally made her life miserable. Her neighbors were prostitutes. Earlier in 1907, the City Council had voted in secret session - with no public notice or citizen debate - to legalize prostitution. The resolution loosely defined the redlight district as centered on the intersection of D and First streets, and Miss Farmer - a 49 year-old school teacher who was always described in the papers as "Miss Lou Farmer" - lived with her aged mother in a house just outside the designated Tenderloin. Miss Farmer particularly had a gripe with the bordello at 720 First St. and sued the owner of the property in hopes of having the "sporting girls" evicted. Thanks to the avid newspaper coverage of that suit, we have a glimpse of why Santa Rosa had the reputation of being a wide-open town in the early 20th century. Yet even while Mrs. McLean was not-to-my-knowledge-ing about all things prostitutional, she readily admitted that she was following the specific rules for "boarding or lodging houses on D and First streets." A medical doctor inspected "guests" who lived there for disease at least every two weeks, and Mrs. McLean dutifully paid a special license of $45.00 per quarter to the city. A register of "guests" was also rigorously kept; a portion of those records were read to the court, and the Santa Rosa Republican reported, "It was a dainty list of flower titles. There were 'Violets,' 'Daisies,' 'Lillies,' 'Roses,' 'Pansies,' 'Flossies,' and even 'Gladys' 'Bernices' and to all these the doctor had certified 'O. K.'"
Miss Farmer's testimony detailed at length the burdens she and her mother had suffered. "The sounds of revelry, mingled with profanity had often kept them awake far into the night," the PD reported. "All kinds of language known in the vocabulary of filth, she said she had heard." She would not repeat it in court: "The witness was spared the distasteful experience of relating the exact vulgarity of language she had heard on a number of occasions. She wrote the worst of it down and handed it to the reporter so that it could go into the record." On the night of August 11, Miss Farmer stated, in the darkness of the night a row of men were barely distinguishable from her view point by the red ends of the lighted cigars that loomed up in the dark background. She had no hesitancy in estimating that there were fifty men waiting for admission int the McLean residence. On August 28, she said, within an hour twenty-five men callers entered the house. On the first Monday in September, Miss Farmer said, she invited some friends to keep vigil with her near the backyard fence so that they could be witnesses. One of the invited friends only, she said, was brave enough to come, and she was a woman. The friend went home at one o'clock in the morning, while she (the witness) remained on watch until two. She detailed how a woman had come before a window in the McLean house, while the curtain was still up and had removed her clothing. She was followed by a man who did likewise. Then the couple took a drink together and disappeared. She said the drinking episode was renewed twice or thrice. Other dates and other events, all tending to show the lewd conduct of the place, were given. Miss Farmer had armed herself with the names of a number of the male visitors at the house on numerous occasions. She was willing to announce them in open meeting if desired. Some of them, she said, were prominent, too. It was decided that the names were not necessary. Miss Farmer concluded: This nearness of the redlight district, with its reeking filth, to her property had ruined her enjoyment of her home and this injunction suit was her only relief. Otherwise she would have to change her residence. There were other witnesses who testified that it was indeed a 'bagnio,' including Birdie Hibberd and Opal Browning, who admitted living at the boarding house and "plying her vocation" as a "sporting girl." In closing arguments, Mrs. McLean's lawyer argued that the house was run under a valid permit or license specially issued to the houses. The court's finding was for Miss Lou Farmer: It seemed that the city ordinance did not explicitly authorize "the occupation of prostitution." The bluenose faction in Santa Rosa claimed that this was a mandate to shut down the entire redlight district, and at least two of the eleven whorehouses were closed in the wake of the decision. But without jumping too far ahead of this chronological narrative, there were more doings about the redlight district the following year, and the house at 720 First street remained a bordello. Sadie McLean, however, was no longer there: The 1910 census shows she moved a couple of doors down to 710 First street, which was an even larger house of ill-fame. Here's the Believe-It-Or-Not footnote to the story: Miss Lou and Mrs. Sadie were not actually neighbors. 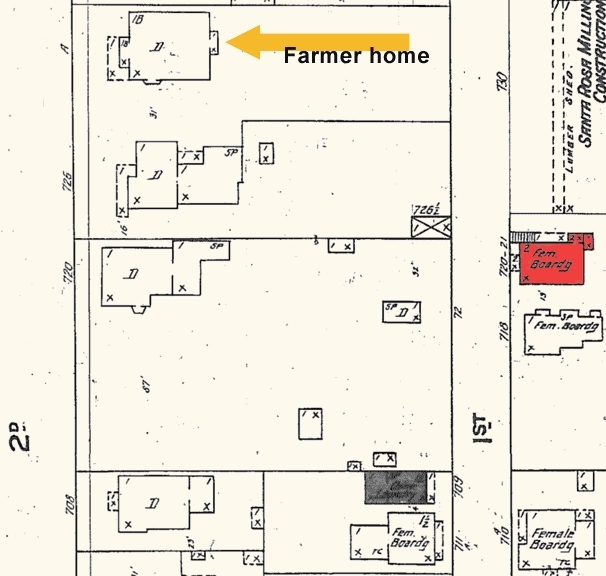 The Farmer home was on the next block, a one-story building at 732 Second street, two lots east of the boarding house. And besides a spacious yard behind their home, the Farmer's had a fence on the First street side of their property, which faced the noisy planing mill. The only way Miss Farmer could have witnessed "the disgusting scenes that are enacted at the McLean house" was by peeping over her backyard fence and sideways at a sharp angle. Alas, neither of the newspapers reported whether defense attorney Butts asked Miss Farmer to explain exactly how craning her neck over a fence to get an eyeful of the doings two doors down on the next block "had ruined her enjoyment of her home." The case of Lou Farmer vs. Dan Behmer for the closing of a house at 720 First street, alleged to be used as a place of prostitution, was opened in Judge Seawell's department of the superior court Tuesday morning. There were a large number of people present to hear the testimony, including the plaintiff, her mother, and members of the ministerial union, as well as others. In the opening of the case Attorney T. J. Butts for the defendant asked that the case be heard behind closed doors, but this was resisted by the attorneys for the plaintiff. Messrs. Crawford and Thompson, they contending that it was a matter of public interest and concern, and they claimed the people should be allowed to know the particulars of the case. The court ruled that the only question involved was as to whether it would develop indecent matter as testimony. After a short recess the trial proceeded in open court. Miss Lou Farmer and her mother, Mrs. S. S. Farmer, were sworn and placed under the rule. The former was the first witness called. She told of the owning of property on Second street which extended through to First street and faced the property in question. Also of the construction of the house at 720 First street and of its immediate occupancy by a number of women. Mrs. Sadie McLean was the next witness called and she proved a very unwilling witness for the plaintiffs. She figited about in her chair and often lapsed into a listless mood, and after the attorneys and court had asked her questions several times over, would arouse herself and ask if they were talking to her. At one time she undertook to explain this by stating that they had brought her up to the court so early she had obtained no breakfast and was hungry. At this the court remonstrated with the witness, telling her that the time for eating would arrive when the noon recess was taken, and she was to answer the questions directly in the mean time. She testified that she was the person who leased the house from Mr. Behmer, and when asked if there were other parties residing there with her, she replied "Sure!" To the question of how many there were she stated that she didn't know, if she had known she was coming to the court room she would have rehearsed the matter. "How many are there residing there with you now," asked Attorney Thompson. "There are two boarders there." "Are they men or women?" They are women." "From whom do you rent your house?" Answer, "I rent from Mr. Behmer." She stated that she paid $25 per month for the place. "What kind of a house did you run prior to April 11th?" Answer, "A boarding and lodging house, just the same." "Mrs. McLean, do you not now and since October 13th, 1904, run a house of prostitution at 720 First street?" Answer, "No sir, not to my knowledge." "Have you harbored or had in the house any women who were prostitutes and who practiced the business?" Answer, "No, sir." She stated that the place was a boarding house, and that she charged the women "boarding" there $5 a week for board. The testimony brought out the fact that she charged 50 cents a night for rooms. But that the roomers were not prostitutes. She also stated that there were a number of men who stayed there. But this was immediately after earthquake. She did not stay there herself, but left the place to the freedom of any one who desired to stay there. And at this time she gave them the use of the house. "During the time you have resided in the house, have any men or boys visited the place?" asked Mr. Thompson. She replied, "Oh, yes, I have a few friends call." Who rented the rooms from you?" "Why, gentlemen!" She was asked, "Did anyone occupy the rooms with the gentlemen, so called?" She replied, "To the best of my knowledge, I don't know." Asked about the keeping of a register of the guests of the place, she produced a book, and after some objections and arguments upon the part of the attorneys, the witness read the names of about a dozen women who were noted as "arrivals," and also about an equal number of departures. She was then asked, "Did any of these women practice prostitution?" She answered, "Not to my knowledge." Passing to the question of liquors Attorney Thompson asked the witness if she had ever furnished liquors, or caused them to be furnished in her house. "I certainly sold them," she answered. This led to the question of license for the sale of liquors, and the witness stated that she has always had a government license for the sale of liquors and supposed she had a city license. This she testified she had since the passing of the city ordinance on April 11th, and she had paid $10 a month prior to that time, as a fine, but according to here tell [sic] did not know what it was for. The question of prescribed examinations required by the city ordinance every two weeks was brought up and she testified that she had had such examinations performed by physicians, but could not give the names of the doctors. When the names of two physicians were mentioned, she said she couldn't state, but later thought she remembered having seen the physician there. As to the certificate to be furnished for the examination, she stated that the same had been made out in a book form, but she was sure they had been destroyed. At the adjournment of court for the noon recess, it was understood that she was to endeavor to find the certificates and produce them to court. In the afternoon session, Mrs. McLean on the witness stand produced the certificate book by which different physicians certify at certain periods as to the physical condition of the "guests" occupying the "boarding houses" in that locality. This certification is in accordance with a resolution passed by the city council for the regulation of such places. Mrs. McLean had destroyed the certificates, she said, but the court ordered that the names of the house "guests" and of the examining physicians be read. It was a dainty list of flower titles. There were "Violets," "Daisies," "Lillies," "Roses," "Pansies," "Flossies," and even "Gladys" "Bernices" and to all these the doctor had certified "O. K." The witness was very reluctant in her answers always, and at times was quite "sassy." Before counsel could object she stated that before the city council made her house a legal place of business and charged her a license, she had paid $10 a month to somebody and for some reason, but she did not know why. The witness' testimony was decidedly in favor of the plaintiff's case. The trial will be resumed tomorrow morning. When Birdie Hibberd and Opal Browning, occupants of the house run by Mrs. Sadie McLean on First street, took the witness stand in Judge Seawell's Department of the Superior Court yesterday afternoon and confessions of a life of shame were wrung from them, together with an admission that the place was a house of ill-fame, and that they were there for purposes of prostitution, they openly corroborated the contention of Miss Lou Farmer in her suit against Daniel Behmer for a permanent injunction restraining him from leasing the house to Mrs. McLean for illicit purposes. Trial of the suit was commenced yesterday morning, and all day long the courtroom was crowded with spectators, most of whom were there out of morbid curiosity. The old and young were there and all walks of life were represented. Representing the Ministerial Union were the Revs. M. H. Alexander, Leander Turney and Wm. Martin. At the outset of the proceedings Attorney T. J. Butts, representing the defendant, asked that all the witnesses be put under the rule and that the case be tried behind closed doors. Former Judge R. F. Crawford, who with Rolfe L. Thompson, represents the plaintiff objected, saying that the plaintiff had nothing that she wished concealed from the public, and it was their desire that not only the Court, but all others interested should hear what they claimed was happening in and around the premises occupied by Mrs. Sadie McLean and owned by Daniel Behmer. In reply Judge Seawell said the only question was whether having a wide-open court in this instance was conducive to public morals. What had to be determined, he said, was whether the house was of the character intimated by the plaintiff in her complaint. After some further discussion along this line in which counsel joined Judge Seawell ordered the witnesses to come forward and be sworn and be put under the rule. Out of three score or more of witnesses called only two were present when the order was made, Mrs. Farmer and her daughter, Miss Lou Farmer. Putting under the rule means that the witnesses must retire from the courtroom during the testimony, so Mrs. Farmer left the room and Miss Farmer was called to the stand, the spectators remained, and Attorney Thompson began his examination of the witness. The deeds to the property were first introduced in evidence and Miss Farmer described its location. Some mirth was occasioned when Attorney Butts objected to the question as to whether the parties Miss Farmer had seen in the house were "men or women," on the ground that it "called for a conclusion of the witness." The objection was overruled as the witness was deemed competent to determine. She replied that they were women, and that she saw three females in the house soon after it was finished. At this juncture Miss Farmer was excused from the stand as Mrs. Sadie McLean had put in an appearance somewhat out of breath and, as she said, "breakfastless." She was intended as the first witness, but the hour of convening court did not agree with her hour of arising in the morning. "Will you take the witness stand, Mrs. McLean?" queried Attorney Thompson in a sympathetic tone. "Sure," came the quick reply, and Mrs. McLean [illegible microfilm] a loud rustle of silk to the chair. She had just mentioned that she had resided at 720 First street since October 13, 1905, and that she had leased the house from Mr. Behmer later at a monthly rental of $25, when the steam calliope of the passing circus parade struck up a familiar air and Attorney Butts' ready sense of humor led him to inquire if the court "wished to adjourn to witness the parade." The remark was passed with a smile, and then Mrs. McLean testified that she had conducted a boarding and rooming house at 720 First street, and that she had one or two, or probably more, she did not remember just how many, women boarders, who paid her five dollars per week board. In reply to a question, repeated more than once, the witness said she was conducting a boarding and lodging house, and was not running a house of prostitution. She denied further that she had harbored women who were prostitutes. She admitted that once in a while the women guests in her boarding house had gentlemen friends call upon them. "Did or does any one visit that house for the purpose of prostitution?" she was asked. "Not to my knowledge," came the short reply. When gentlemen called and rented room they paid for them, Mrs. McLean testified. Asked whether anyone occupied the rooms with the gentlemen the witness replied, "to the best of my knowledge I do not know." The witness mentioned a number of young women who had been guests at their home, many of them, she said, as far as her knowledge went, lead moral lives. The witness admitted that she sold liquor, and that since last April she had a license to do so, and before that she though the ten dollars a month fine she had paid was sufficient license. When court resumed at 2 o'clock in the afternoon Judge Crawford read an authority to the court based on "Wood's" explanation of what constituted a "public nuisance." 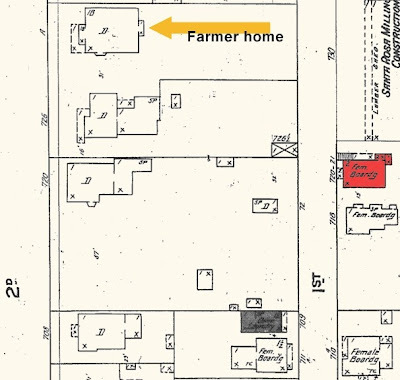 Deputy County Surveyor Tom McNamara was called to testify as to some measurements made showing the distance from the Behmer house to the Farmer property, which was 182 feet. At the time when he accompanied Mr. Thompson to take these measurements he testified that he saw two women at the place wearing what appeared to be loose gowns. Before Mrs. McLean left the witness stand at the morning session she was instructed to look in her house during the noon recess and see if she could find any medical certificates that had been issued to herself or any of her women guests. When she returned to the witness stand in the afternoon she said she had been unable to find any certificates, but she had brought a stub book along from which certificates had been removed at the time they were issued and certified to by visiting physician. Such examinations, she said, were made every two weeks or so. Attorney Thompson read the "O. K. 'd" stubs in the license book into the record. Soon after this the witness was excused and Miss Farmer was recalled. She was given a long direct and cross-examination. During the testimony of the witness a discussion arose as to whether a woman wearing a kimona is sufficiently dressed. The witness and Mr. Butts both had their inning on the subject, and Miss Farmer complimented the attorney's knowledge of dress fashions. The kimonas worn by the women residing at Mrs. McLean's house were not the kind, neither was the way in which they were worn, such as would mark the dressing of "any decent woman," in the opinion of the witness. Miss Farmer testified that she had seen the women living in the house complained of walking along the street and on the porch in front of the house clad very scantily. She said she had heard them hail men and boys in passing and try to induce them to go into the house. On one occasion, she said, she had seen from her backyard a Chinaman, bearing a tray of food, go into the McLean house and walk up stairs into a room occupied by a man and woman. Later when the man came and put the tray outside on the porch, she said, he was wearing little or no clothing. Miss Farmer said times without number she and her mother had been [illegible microfilm] and women and the sounds of revelry, mingled with profanity had often kept them awake far into the night. She told of automobiles that had driven up to the place, and of the coarse greetings given the chauffeur, every sentence from the feminine lips, she said, having wound up with an oath. All kinds of language known in the vocabulary of filth, she said she had heard. What she had seen and heard and what the neighbors had told her, left little doubt in her mind but that it was a house of illfame. The witness detailed instances when she had seen men and boys, and some other women, whom she said were not intimates of similar houses, enter the McLean house. The witness was spared the distasteful experience of relating the exact vulgarity of language she had heard on a number of occasions. She wrote the worst of it down and handed it to the reporter so that it could go into the record. Attorney Butts, at this juncture stated that his motive in suggesting that the proceedings should be behind closed doors, was to meet just such an emergency as this instance presented. The witness then gave days and dates on which she had watched proceedings at the house across the way for the purpose of furnishing testimony. She said that on one occasion a man came up in a delivery wagon and she described how the women had played a hose on him because he would not walk into their parlor. One of the women had hardly any clothing on at all, and was minus stockings or shoes, she said. Finally the man got away. The witness said her enjoyment of home had been despoiled by the conduct of this place in the redlight district. In cross-examination she said that she expected to pay for the prosecution of this suit and did not expect to receive any aid from any association or organization. She reiterated on cross much that she said on direct examination. She mentioned that drinking had been allowed on the premises. Miss Farmer had heard men come to the place and call for "whiskey straight," and when the women had handed them something in glasses she supposed their wishes had been gratified. She testified for herself and for the neighbors, whose names she enumerated, that Sadie McLean bore a bad reputation. Much of the matter already testified to by the witness was amplified before she left the stand, and when she retired Birdie Hibberd was called. She testified that she boarded and roomed at Mrs. McLean's. "What is your business?" asked Thompson. "I am a sporting girl," was the reply. "In other words you mean to say that you are what is known as a prostitute?" the inquiry pursued further. The witness then testified that prostitution was practiced in the house, and that Mrs. McLean's was a house of illfame. Opal Browning, another young woman, rooming and boarding at Mrs. McLean's, corroborated Miss Hibberd's testimony, admitting that she was living a life of shame, and was plying her vocation at the McLean house on First street. The last witness for the day was Deputy Sheriff McIntosh, who previous to last January, was for nine years a member of the Santa Rosa police department. He testified in response to questions that the house had borne the reputation of being a house of prostitution and the inhabitants the reputation of being prostitutes. The trial will be resumed at 9:30 o'clock this morning. In the Farmer-Behmer case yesterday afternoon after Mrs. Sadie McLean had finished testifying as to the domestic purity and moral cleanliness of her "boarding house," two of its inmates, "guests," Birdie Hibbard and Opal Browning, on the stand shamelessly confessed that the house was a place of ill fame and they were leading a life of prostitution. It would appear that the broad testimony of these two "sporting girls," as they called themselves on the witness stand, would land the cloudy statements of the mistress of the place pretty close to perjury. Deputy Sheriff McIntosh testified that he had been on the city police force for nine years and that the McLean house had always borne the reputation of being a house of prostitution and its inhabitants prostitutes. Miss Lou Farmer, who brings the suit to enjoin Dan Behmer, the owner of the house from leasing it for illicit purposes, testified late in the afternoon. She said she and her family were continued witnesses of the disgusting scenes that are enacted at the McLean house. Night and day men are visiting the inmates and often when they all -- men and women -- get to drinking liquor, their exposure and lewd conduct is shocking. Only 182 feet separates her home from the Behmer house and she can easily hear the profane and vulgar language that is used in those places. She has heard automobiles drive up to the doors during the night and the coarse and often filthy greetings between the chauffeurs and the women. With window blinds up she has seen people, male and female, in that house remove their clothing and deport themselves disgustingly. The vile language which she has constantly heard she had written down for the court records and the bagnio vocabulary was handed to the official stenographer. Miss Farmer told of the large number of visitors she had seen enter McLean house and said that on one occasion within the space of an hour she had counted twenty-five men enter the place, and this number was often far under the number of men who passed in that time through the McLean doors. She had a list of the names of visitors -- some of them prominent, too -- that she could read to the court. The court was merciful and they were not read. The witness said this nearness of the redlight district, with its reeking filth, to her property had ruined her enjoyment of her home and this injunction suit was her only relief. Otherwise she would have to change her residence. In the hearing of the case Wednesday morning Police Officer I. N. Lindley took the stand showed himself to be either a philosopher, a splitter of words or a humorist. He had [testified] that he was acquainted with the character of the reputed "house" run by Mrs. Sadie McLean, and its knowledge dated from its beginning years ago, and extended to the present. "What is and what has been the reputation of that place?" asked Attorney Rolfe L. Thompson in his clearest, precisest manner. "Its reputation, except for a period, is a house of ill fame," was the answer. "And during that period you refer to what was its reputation," continued Mr. Thompson, in his search for First and D street reputations. "During that period it was a 'boarding house'" answered the officer Ike, amid the appreciative laughter of the spectators. The title "boarding house" appears to cover, if not sins, illegal reputations. A discussion arose among counsel over the term that was a distinction with out a difference, and Judge Seawell, who is something of a humorist said, "Oh, go on, never mind the name, a rose by any other name would smell as sweet." City Clerk Clawson testified that by authority of the city council licenses to run boarding houses had been issued to all the places of ill fame in Santa Rosa. Nothing in his testimony however showed that those places were authorized to sell liquor. An old man testified that in going to his work on First street near the Behmer house he had seen the women very much in undress out on the street. A young man told on the stand that with several male companions he had visited the "girls" and his further testimony left no doubt as to the real character of the place. Mr. Butts addressed the court stating that he would not put any witnesses on the stand denying the allegation that the McLean place was a place of prostitution. J. W. Curry on the stand testified to the decrease of rental values near the "boarding" houses of First and D streets. He stated that rents in that locality were one-third lower than property in other portions of the city. On cross-examination Attorney Butts weakened Mr. Curry's testimony and established a suspicion that witness was hardly competent to testify in the matter. During the afternoon several witnesses with testimony of minor value were examined, pro and con, on the stand. The deposition made by Daniel Behmer sometime ago was offered in evidence by the plaintiff. In the declaration defendant avers that he first rented the house to a woman who stated that she intended to run a boarding house for the accommodation of the females occupying the houses in the vicinity. The taking of testimony closed with the examination of Behmer on the stand, who testified that he did not know the real character of the place after he rented it, but he has rented it for a boarding house. The case will be argued tomorrow at 10 o'clock and submitted. The further inquiry into the character of the house on First street leased by Sadie McLean and owned by Daniel Behmer [illegible microfilm] by the evidence given on the previous day ws resumed in a courtroom crowded wit spectators, including men, women and boys on Wednesday morning. It seems that there was a possibility of a technical point being raised as to Behmer's knowledge that the house owned by him on First street was being used for illicit purposes. This was adduced as the reason for further testimony to prove that the house was one of illfame. So it was put in. One boy, not seventeen years of age, whose fresh clear face and manner indicated that he probably known little if anything of the primrose path that leads to the redlight district, was called to the witness stand and testified that he had accompanied a cousin of his, aged seventeen, to the McLean residence, and had waited while his relative visited the room of one of the young women there. If the cousin goes calling there or elsewhere again on a similar mission he will probably leave this lad at home. When court resumed Deputy Sheriff McIntosh testified that the McLean place had borne the reputation of being a place of illfame. Mrs. Susannah S. Farmer, the aged mother of the plaintiff, Miss Lou Farmer, was called to the witness stand. She is a pioneer woman of Santa Rosa, having lived here over fifty years. She recalled a period of three weeks when, she said, she had been unable to get to sleep at night in her home by reason of the noise and language from the Behmer-McLean house back of her property. On one occasion, she stated, she also saw a group of men in the street outside the McLean house, at least she supposed there was a man back of each lighted cigar that dotted the dark background. She said that she attempted to count the cigar ends, but got mixed in her arithmetic. At this juncture Attorney Butts announced that while all the evidence regarding the reputation of the house had gone into the record under his objection, he did not propose to call any witnesses to contradict it. He would not admit, however, that his client, Mr. Behmer, was cognizant of the uses to which the house was being put. Jean Maxwell and Allen McKenzie, the latter a carpenter, were witnesses. McKenzie testified as to having seen two women inmates of the McLean house and two others from an adjoining house having a social chat together one morning about eight o'clock. The girls were clad in their nightgowns at the time and were on the street. Some of the women tried to bewitch him with their smiles, but he scorned them. City Clerk C. D. Clawson produced his records and testified that a liquor license had never been issued to Sadie McLean nor to any other woman at 720 First street during the time he had been city clerk of Santa Rosa, six years. On April of this year, he testified in response to Mr. Butts that a license to run a lodging and boarding house had been issued under the police regulation adopted by resolution of the council fixing the licenses of the boarding and [illegible microfilm] D and First streets at $45 per quarter. Dr. David P. Anderson, whose home is on Sonoma avenue, and who has to pass along E street from which point a glimpse can be obtained of the Behmer house and the others on the street, testified that the Behmer house bore the reputation of being a house of illfame. In cross-examination Attorney Butts asked Dr. Anderson if he had paid anything towards a prosecution fund in this suit. The witness replied that he had not. "I would be glad to do so, however," he added. "Was any of it [illegible microfilm - probably 'tainted' -ed]" asked Judge Crawford of Mr. Butts. "No tainted money for me," was the attorney's quick rejoinder, and the court room rang with laughter. S. P. Erwin was another character witness called and like the rest he said the reputation of the place was not good. He named over some of his neighbors whom, he said, agreed with him in his opinion. J. W. Curry was the first witness to decorate the stand after the noon recess and he testified as to an exchange of compliments he had heard on First street at the place involved on one occasion while he acted as watchman at the planing mill next door. The language used should have been told behind closed doors. Having dabbled in real estate Curry was called as an expert to testify as to property values and he ventured that the value of the Farmer property had been depreciated a third by reason of the presence of the McLean place and the manner of conducting the same. With the excusing of the witness from the stand the case of the plaintiff was rested. Attorney Butts for the defendant offered in evidence the city charter adopted by the people of this city at a charter election in 1905, and afterwards enacted as a law by the State Legislature, stating that a section of it gave the city council the right to define nuisances, regulate bawdy houses and houses of illfame, etc. Mr. Thompson, of counsel for the plaintiff, objected to the introduction of the charter, but the Court overruled the objection. In argument it was stated that the Court would hear a discussion of the matter of the power of a municipality to contravene a section of the state law. Two licenses issued to Sadie McLean under the resolution permitting the licensing of boarding and lodging houses on a portion of First and a portion of D streets, for $45 per quarter, were offered by Mr. Butts and admitted in evidence, as was the lease of the premises by Behmer to McLean. Without offering any further evidence Attorney Butts rested his case and the argument was set for Thursday morning at ten o'clock. "These houses of prostitution are common or public nuisances...No persons aiding, abetting or attempting to protect houses of prostitution in carrying on their business, can evoke a court of equity in any such proceeding." The attorney argued that the resolution being contrary to the constitution, was invalid and even if it was true that Behmer first leased the house to a person who rented the premises for a boarding house in which the women inmates of bagnios would live, he was liable to prosecution, as he was aiding in the maintenance of an illegal institution. He called attention to the aged Mrs. Farmer who had lived so many years in that block, who had seen the value of her property fall year after year because of the blighting influence of the places of prostitution in the vicinity. When she would open her windows for air her ears were assailed by vile language and her view obstructed by prostitutes and their male companions. Not only did plaintiff pray for an injunction, but would ask for damages for injury done herself and property to the amount of several hundred dollars. He ridiculed Behmer's plea that he did not know the character of the house and that he had leased it for another purpose. Behmer, he said, had gone to that door every month for years and collected the rent and he knew what the place was. T. J. Butts, for the defense, called attention to the written agreement in the lease of the house, 720 First street, which stated that it should not be used for immoral purposes. Consequently as Mrs. Sadie McLean had violated the provisions of the lease, she, and not Behmer, was liable to prosecution if her place was declared a nuisance. A lessee, the lawyer held, is practically the owner of the premises, and is wholly responsible for everything that occurs on the premises. Behmer, who first rented the house understanding that it would be used as a boarding house, could no more be prosecuted that could a restaurant keeper who sold a meal to an inmate of a bagnio. Mr. Butts pleaded that the house was run under a valid permit or license specially issued to the houses, call them boarding houses or houses of prostitution or any title, and armed with that special authority, they were not objects of attack on the part of any private citizen of Santa Rosa. Such prosecution should come officially. The city council had regulated these places, no difference what name they went by, and the council knew the character of the houses when it passed the resolution, and that regulation could be pleaded in a measure as justification. Summing up counsel held that the owner's ignorance of the purport to which the premises where to be put, his stipulation in the lease, the existence of a city ordinance regulating the premises were to be put, his stipulation in the lease, the existence of a city ordinance regulating the premises and a private individual having no authority to proceed against them, was the defendant's case. Judge Crawford for the plaintiff reviewed the evidence, arguing that the case was proven in every particular against the defendant. He was speaking when this paper went to press. Judge Emmet Seawell rendered an opinion in favor of the plaintiff in the case of Lou Farmer against Daniel Behmer, to restrain the latter from renting and leasing premises on First street for purposes of prostitution. For once the law has been found adequate to suppress such places, and the good work so auspiciously begun will no doubt be carried on until the city is rid of the district in which vice has been permitted to flourish unmolested for many years. The court orders that a writ issue restraining the defendant and gives Miss Farmer judgment in the sum of twenty-five dollars and costs of suit. In his opinion Judge Seawell reviews the causes of the action and declares the suit is to prevent defendant from leasing property near the residence of plaintiff to dissolute women for an unlawful purpose. The testimony of many witnesses showed that the property was used for such purpose and that Behmer must have had knowledge of the same. The property was leased to Sadie McLean for a period of five years, but the writing was not acknowledged or recorded. The court declares that Miss Farmer's property came to her through her ancestors, acquired fifty years ago, and that it cannot be said she voluntarily moved into the neighborhood in which the conditions complained against were in existence. Furthermore, the court says that a public nuisance can never ripen into a right or an easement. At the trial of the case Sadie McLean denied that her house was used for immoral purposes, but inmates of the house declared it was used for such purposes. The police officers told the court that the reputation of the house was such and had always been such. In a recent Petaluma case of similar character the officers declined to admit knowledge of such places, but the local officers were not afraid to tell the truth regarding what they knew. Santa Rosa's redlight district will soon be a thing of the past. Yesterday Judge Seawell granted the writ of injunction prayed for by Miss Lou Farmer, restraining Dan Behmer from leasing his premises on First street to Sadie McLean, who conducts a house of ill repute. The Court also awarded Miss Farmer twenty-five dollars damages and her costs of suit. In view of the testimony introduced at the trial the Court's decision did not occasion much surprise. It is the intention of the reform element now to proceed against other property owners in the district, asking the court to enjoin them as it did Behmer. It is said that the property owners rather expect this to happen. In the Behmer suit Attorney T. J. Butts will take an appeal to the Supreme Court from Judge Seawell's decision. The opinion is a lengthy one. It holds, among other things, that Miss Farmer, by reason of the proximity of her property, has suffered both in kind and degree more than any one else. It will be remembered that at the trial it was claimed that an ordinance passed by the city council legalized prostitution, he claim resting upon a city charter provision to the effect that the council shall have power to prohibit or regulate bawdy houses. "The word regulate," the Court says, "carries with it the power to license. But the question arises at once, is a house of prostitution a municipal affair, or a question of public morals, the regulation of which is the sovereign power of the state"? The Court holds that "prostitution does not partake of a municipal affair," and that while municipal corporations may legislate with certain restrictions of all matters municipal, "it would seem that they cannot overthrow a law which is founded in public policy." Regarding the leasing of the premises, it is held in the opinion that if the business is unlawful, then the lease made by the defendant to the tenant to conduct an unlawful business is void. "It is very clear that no license has been issued to the occupant of defendant's house to engage in the occupation of prostitution. The ordinance itself does not in express terms grant any such right." Upon the point at issue the Court dwells at length and authorities are cited bearing upon them. What constitutes nuisances is defined and the aims of public policy and morality are enlarged upon. Reference is also made to the baneful effect of houses of ill fame upon the morality of communities and their tendencies to corrupt and harm the young. In the award of damages the Court mentions that only a nominal sum is asked for and only a nominal sum is given. The main thing desired was the injunction and it is ordered that a writ issue. Former Judge R. F. Crawford and Rolfe L. Thompson were the attorneys for the plaintiff. TEN DAYS' NOTICE FOR "REDLIGHT"
As intimated in the Press Democrat on Saturday morning steps have been taken to close up the entire redlight district in Santa Rosa. Saturday afternoon Constable Boswell served notices on the landladies and inmates of the houses of ill-fame, as well as the owners of the premises, that ten days from date they must vacate and refrain from using or leasing the premises for purposes of immorality. If these notices do not have the desired effect then Attorneys R. F. Crawford and R. L. Thompson will proceed with injunction suits as in the Behmer suit. It is probably that some of the houses will be vacated without further litigation. It is also probable that the houses thus vacated will be rented to Japanese. One of the property owners stated Saturday afternoon that some Japanese were anxious to rent and would pay nearly as much rent and therefore he did not care. At midnight last night the time given in the notices to the owners, lessees and occupants of the houses in the redlight district that the premises must no longer be used as houses of ill-fame, expired. Attorney R. L. Thompson, who with Judge R. F. Crawford, represented Miss Lou Farmer in her injunction suit against Daniel Behmer, who had the notices served several days ago, was seen yesterday and he stated that it was their intention to bring either criminal or civil actions, or possibly both, if the premises were not vacated or their use for improper purposes abated. The course had not been definitely decided, he said. It may not be until Monday that summons are issued and complaints filed. It may be today. Mr. Thompson says it is the intention of the prosecution to finish the job it has commenced. It will be remembered that Miss Farmer won her suit against Behmer, and then the notices were served on the other people. Mr. Thompson stated that he had been informed that three of the houses had been closed up. One of the property owners told a Press Democrat representative that he did not care whether he leased his premises any more to women as some Japanese were anxious to rent the place and would pay him about the same rent. It is understood that some of the women inmates have already gone elsewhere to board and others are preparing to do so. It is also said that some of the property owners may contest the matter in the courts. Developments as regards the whole affair are awaited with some interest.